I made a dozen pumpkin muffins last night, and promptly gobbled half of them. Can you blame me? These babies are light, moist, and perfectly perfumed with the calming aromatics of pumpkin pie spice. To taste them is to love them. 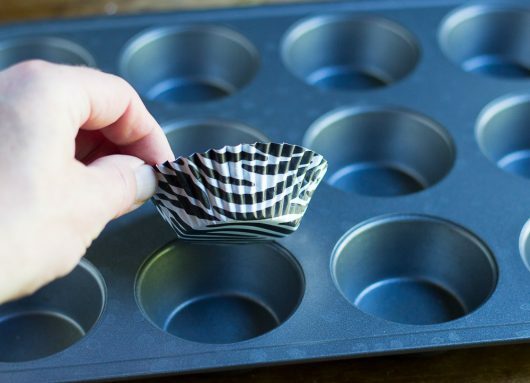 To start, grab a standard muffin tin, and line it with zebra-striped liners. No zebra-striped liners for you? Tsk, tsk, tsk. Use ordinary white liners. 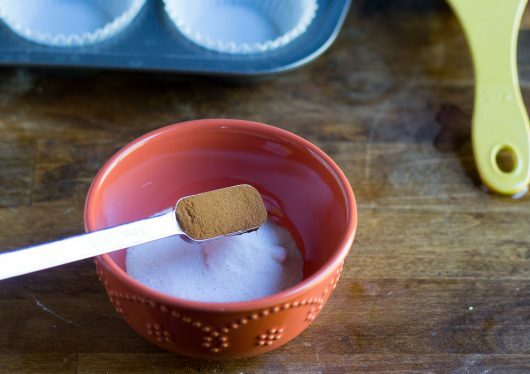 Now mix together 1 tablespoon sugar and 1 teaspoon ground cinnamon in a small bowl, and set it aside. 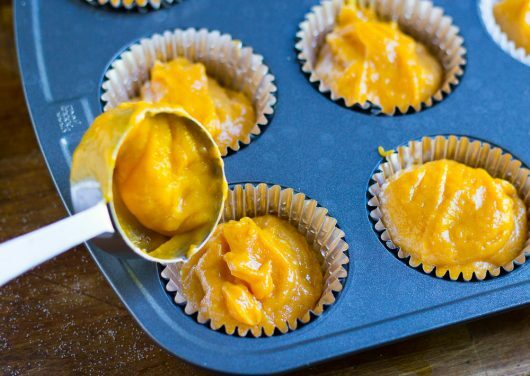 We’ll use this confection to top our muffins. 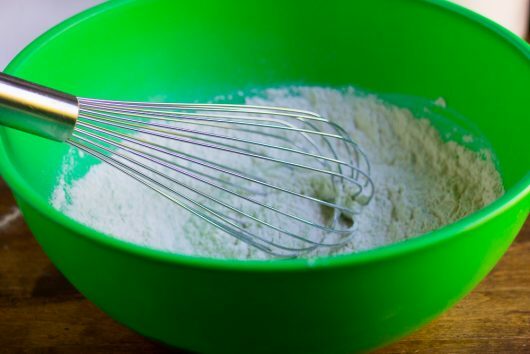 To make the batter, tip 1 1/2 cups all-purpose (“plain”) flour into medium size bowl. 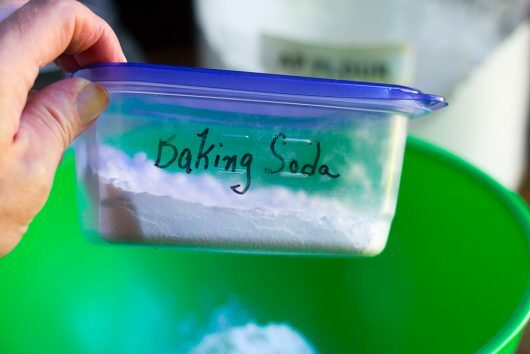 While swinging your hips in some suggestive fashion, whisk these dry ingredients together. 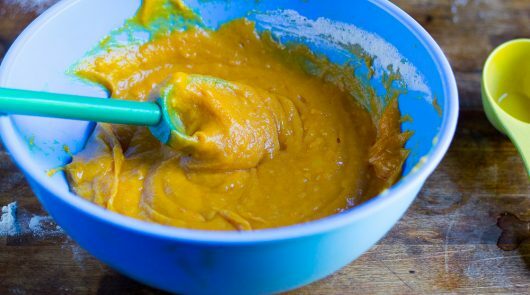 Next, fling 1 cup of pumpkin puree and 1/3 cup neutral-tasting vegetable oil into a large bowl. Oh. 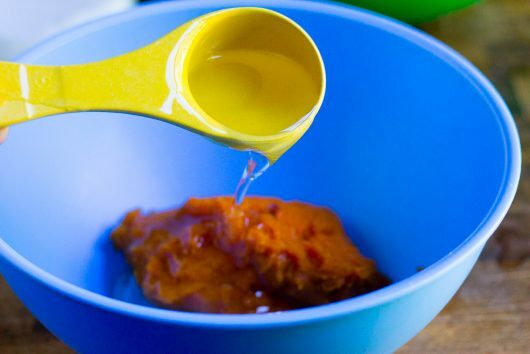 Wanna make your own pumpkin puree? 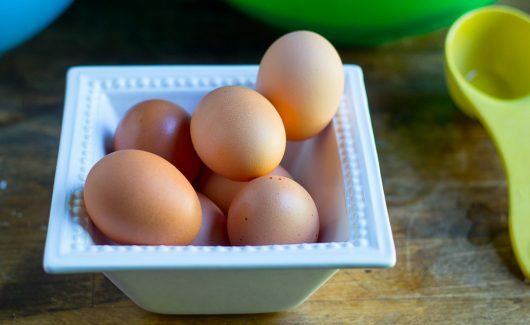 Click here for my easy-peasy recipe. And 1 1/4 cups sugar. 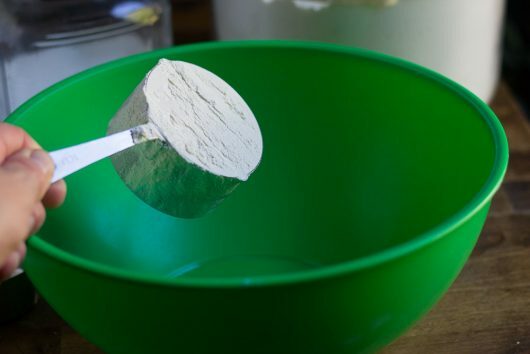 Add the dry ingredients to the wet, and violently stir with a stout spoon until perfectly smooth. 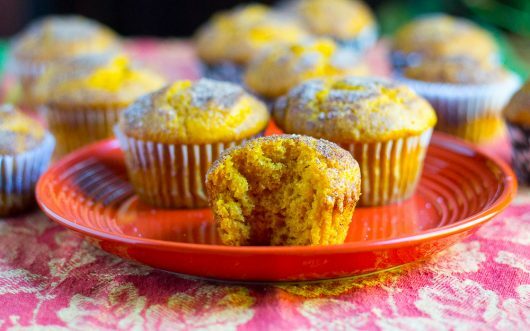 While autumn leaves drift past your window, divide the batter between the muffin cups, filling each about 3/4 full. Then sprinkle the tops with the cinnamon-sugar mixture. Bake on the center rack of a pre-heated 350°F oven until the muffins rise and their glorious perfume fills the air — 25-30 minutes. Share these remarkable muffins with your spouse, your child, or the hot UPS guy who rang your doorbell just now. Or, just eat 6 of ’em all by your lonesome, and pop the rest into your freezer. This way, you can enjoy a muffin or two for breakfast. They’ll reheat nicely in the microwave oven. Love all things pumpkin? You can let me know by leaving a comment. As always, I love hearing from you. 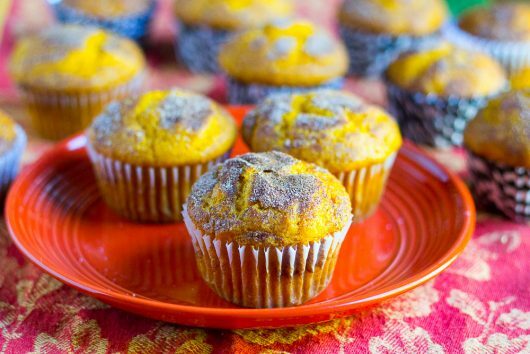 These light, moist, and perfectly-perfumed muffins are just the ticket for a crisp autumn day. Serve them with coffee for breakfast, or with tea or spiced cider for an afternoon treat. Put oven rack in middle position; preheat oven to 350°F. 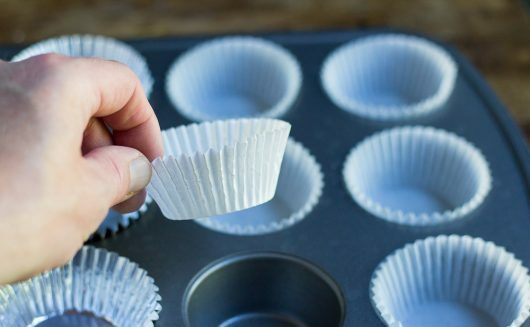 Put liners in muffin cups. 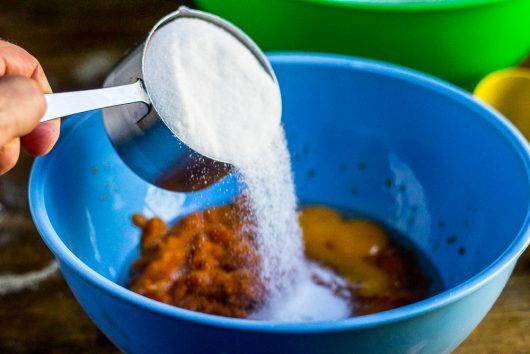 In a medium bowl, whisk together flour,baking powder, baking soda and salt.In a large bowl, whisk together pumpkin, oil, eggs, pumpkin pie spice, and 1 1/4 cups sugar until smooth.Add flour mixture to pumpkin mixture and stir just to combine. Do not over mix. Divide batter among muffin cups (each should be about three-fourths full), then sprinkle tops with the cinnamon-sugar mixture. Bake until puffed and golden brown and wooden pick or skewer inserted into the center of a muffin comes out clean, 25 to 30 minutes. Cool in the pan for five minutes, then transfer muffins to a rack for further cooling. Serve warm or at room temperature. 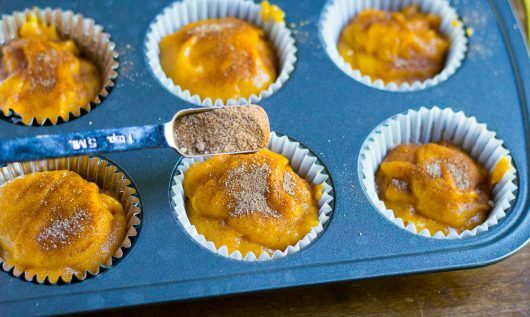 NOTE: Feel free to use your own, homemade pumpkin puree for this recipe. Watch Me on Facebook Live! …just send that UPS guy down my way. Will have to try these today…have all the ingredients & always have zebra liners on hand…Happy Tuesday! Kevin–I love your recipe steps—“swinging your hips suggestively” and “violently stirring”! You’re an absolute riot. And the recipes are great too. Can’t wait to try this one. Your recipes are so approachable and funny! Clear directions, beautiful photos, delicious results and none of the elitist bruhaha you see on some other sites. And these look wonderful… can’t wait to try them! It’s already turn-on-the-oven weather here in New England. I wonder, can applesauce be used in place of the oil? 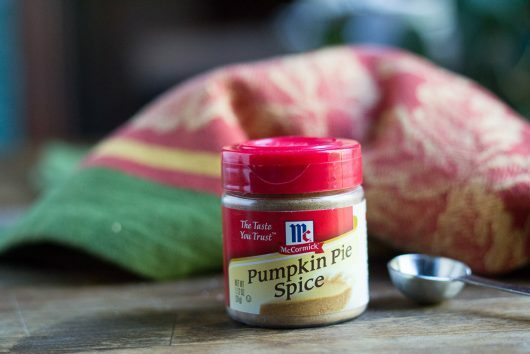 I’m not a huge fan of pumpkin pie, but watch out pumpkin muffins and pumpkin bread. You are singin’ my song. I am so all over this today!! The COPY & PASTE includes those instructions. Thanks for this Kevin – I love Pumpkin foods… ALL of them! Hi Debbie – Yes, the dry ingredients are added to the wet. Pictorial is fixed now. Let me know how the muffins turn out for you! Hi Kt mm – I’ve never substituted applesauce for the vegetable oil in this recipe. So no definitive answer for you. Sorry ’bout that! Spelt flour works just as well sniff has a higher protein level. We have some 40 pumpkins weighting in around 15 lb a piece this year, wowie, talk about a pumpkin year! Yes, I have used applesauce as a substitute and it works fine you might need to add more then amount of oil Kt suggests . Oils make a finer texture. Have to make them for tomorrow. We have a “Social Group” who gets together a few times a month for Potluck Dinners, Luncheons, Ceramics and “Just because…”. 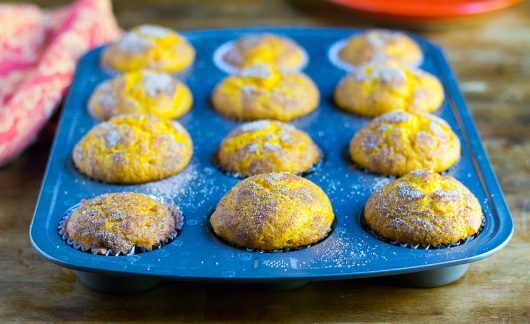 I love pumpkin muffins all year round! 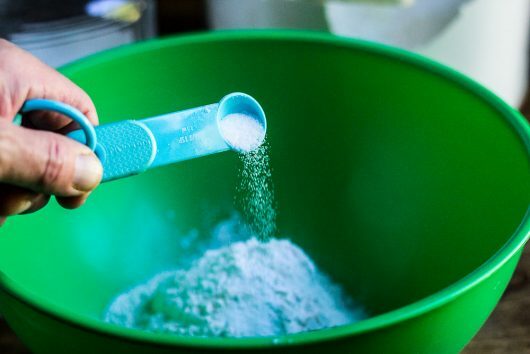 I’m curious, I’ve always been taught beating quick-bread batter violently makes it tough. Can I stsrt taking my aggressions out on my batters? I am so makin these, today! I made pumpkin pancakes yesterday and have just enough leftover pumpkin. Your directions made me giggle, and I’ve not even had my coffee yet! This one sounds yummy , but boy am i gonna have to substitute. I am off sugar for awhile likely for keeps . and you already know this ditz is gluten free. I ‘ve got the general idea and will play with it I Love pumpkin anything and I’m still trying to win my husband over to it. These muffins were fabulous!. I did start with my own grown pumpkin and made the puree. I had just the right amount of spice and were extremely moist and yummy. Everyone enjoyed them. Thanks for a great recipe. Sunday started off with great recipes and even better directions- No wonder I love to make delicious meals with all of that suggestive hip swaying- Who could resist? I so enjoy your recipes Kevin and your descriptive instructions are just absolutely unique. You make cooking and baking a fun time in the kitchen with a bonus of something delicious to eat. Hi Kevin. I saw your video today and I think you mentioned birds eating your blueberries. Leave them a couple and cover yours with tulle fabric and anchor. I used a few bricks. Sun and rain comes in but no birds! Love your site and sense of humor. Oh I use white tulle. Lol. 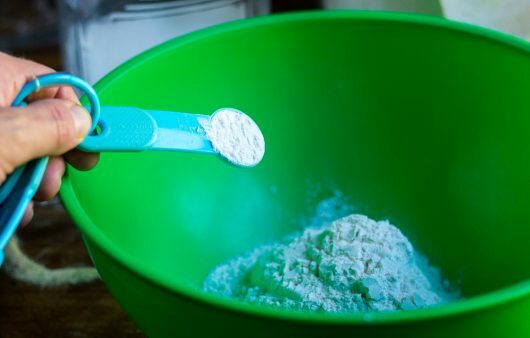 Kevin, can you substitute whole wheat flour in lieu of all purpose flour? You state one can of pumpkin. What would the weight of that can be?? Am I missing something? You state one can of pumpkin. What would the weight of that can be?? Am I missing something? MY BAD YOU STATED ONE CUP!! Kevin those muffins look great. I must try them. Incidentally; eons ago when I was a young chap running around London smoking Gauloises cigarettes and chatting about Andre Gide and Edith Piaf with friends, we’d stop off at a coffee shop just off Piccadilly Circus and drink Espresso and eat rum babas. (Baba au Rhum) How about a recipe? Right up your alley methinks. Thanks. My daughter (12 y/o) used your recipe to make these today. They are great as-is but she got the idea to top them with a pumpkin spiced cream cheese frosting. We loved them both ways. Today I followed your recipes for pumpkin breads and pumpkin cinnamon rolls. Dangerously good on both counts. Also froze pumpkin puree as you described. Next will be the muffins! Wonderful site Kevin and I enjoy and use your gardening tips as well as yout recipes. Thank you.